By shifting focus on this new record, fitting the experiments into more traditional structures instead of the other way around, Megafaun has produced one of the best records of 2009. Megafaun's debut, Bury the Square, was a bracing mix of tradition and experimentation. Within the album's expansive, droning tracks, there were fully realized and affecting sounds of folk, country, and blues. They sounded as if they played out of some wide, abandoned barn that was being bombarded by television static and other technological hums. But with Gather, Form & Fly, they at least start by laying the drones aside. For the first half of the record, they bury the ones and zeroes deep in the ground -- to grow, as it turns out -- and instead fully inhabit all those musical traditions from Bury the Square. The difference is that here the songs are stronger, and ready to stand on their own rather than mesh into an album-length haze. The stylistic variety on Gather, Form & Fly is more pronounced as well, and each sound is as well-executed and shimmering as the one before it. The sun-drenched folk-pop of "Kaufman's Ballad", following a brief but beautiful instrumental opener, starts the album with a song that is both moody and bright. It is immediately infectious, but the Byrds-ian harmonies and dovetailing strings over drums that rustle and fade give the song an ominous stillness. "The Fade" could be that song's sunny cousin, however, twisting all those same elements away from the shade and into the sun. Those first songs are startlingly straightforward for a band so keen on live improvising and noise play. And the country rock feel of those, along with the lilting balladry of "Worried Mind", the mountain stomp of "The Process", and the bluesy shuffle of "Solid Ground", might make it seem like these guys have turned into a head-on Americana band since last we heard from them. Of course, since all of those songs are as strong as the last -- with "Worried Mind" and "The Fade" being flat knockouts -- a simpler dusty trail might not seem so bad. But buried between all of these is the eccentric "Impressions of the Past". The band spends half of the song's five minutes trying to find the right sound. They're firmly planted in bouncy piano-pop throughout, which is itself a shift away from the sawdust plucking of the other tracks. But they take this seemingly simple pop sound and put it through the ringer. The opening sounds like if the Jayhawks recorded Hunky Dory, before shifting into a pastoral and jazzy piano interlude that fades into a chiming chamber-pop trudge. From there they move into some stringy electric Brit-folk lines that transition nicely into a Townsend-like proggy build up. So yeah, it moves all over, until at last the music cuts out and the three players sing without backing music. When the music does come in, it's a simple piano romp, simpler than all the roads the song traveled before the vocals came in. It's as much an impressive song in its own right as it is evidence of just how much music these guys take in and weave through their sound. But it is also far from the only experimental dabbling these guys try on Gather, Form & Fly. Remember the ones and zeroes buried for the album's first half? Well, between "Solid Ground" and "Darkest Hour", there is a healthy rain -- seriously, you can hear it on record -- and those drones start to grow and poke up out of the rich loam. "Darkest Hour" takes a sweet harmony and manipulates the vocals into fuzzy scratches and blips draped unevenly over crashing drum work. "Columns" is full of clanging, kitchen-sink percussion that fades into a faint buzzing that sounds like a chorus of pixelated crickets and cicadas. "Guns", the longest and perhaps best track on the album, is a galvanizing show-stopper. "We'll be the first to hum the song we learned from tired tongues", the trio sings, with enough power to sound like an army, their voices meshing once again with stunning beauty. But the call-to-arms number, at first a full, sweat-drenched blast, is overtaken by the thunder of drums that shifts the song into a seething, insistent drone. Yet Megafaun doesn't surrender everything to their humming muse on the second half of the record. The album ends with "Tides", a hushed ballad that clocks in under three minutes. There's no buzz and rattle on this one, just plucking and singing, proving that in the end the band's biggest successes can come, sometimes, from their simplest sounds. Gather, Form & Fly is a stunning leap forward for a great young band. Bury the Square surely showed off their potential, but by shifting the focus on this new record, fitting the experiments into more traditional structures instead of the other way around, these guys have proven themselves to be brilliant songwriters and players on top of their talents with noise manipulation. 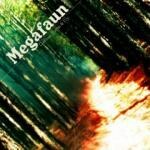 To a song, this album is soaked with charm and bone-deep feeling, and by fully realizing their strengths on this sophomore effort, Megafaun has given us one of the best records of 2009.